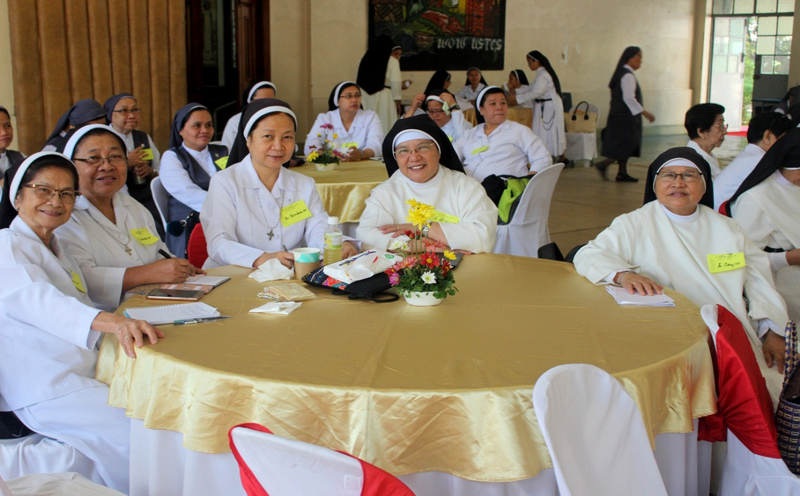 March 15, 2019, Manila, Philippines – Members of the Adrian Dominican Sisters Our Lady of Remedies Mission Chapter were among 179 participants in the 2019 gathering of the Dominican Sisters International-Philippines (DSI-P) meeting in February at the University of Santo Thomas Seminary. The Adrian Dominican Sisters were one of 15 Congregations of Dominican Sisters that participated in the event. Father Rolando de La Rosa, OP, speaks on the Beatitudes as a sure way to holiness. The theme of the Day of Recollection was “Dominican Style of Holiness: A Glimpse to the Genius of a Woman.” Father Rolando de La Rosa, OP, guided the Sisters in their reflection, focusing on the Beatitudes as the sure way to holiness. 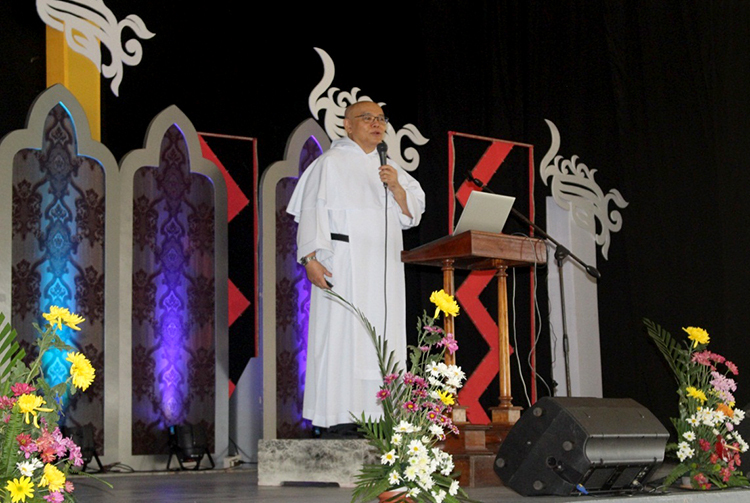 In his introduction, Father de La Rosa reminded the Sisters of the current state of the world: suffering, violence, and leaders who attempt to solve problems like illegal drugs with more violence. Consumerism and materialism drive people to work hard to get what they want. Father de La Rosa noted that this materialism is creeping into the lives of religious, as evidenced by convents filled with consumeristic goods. 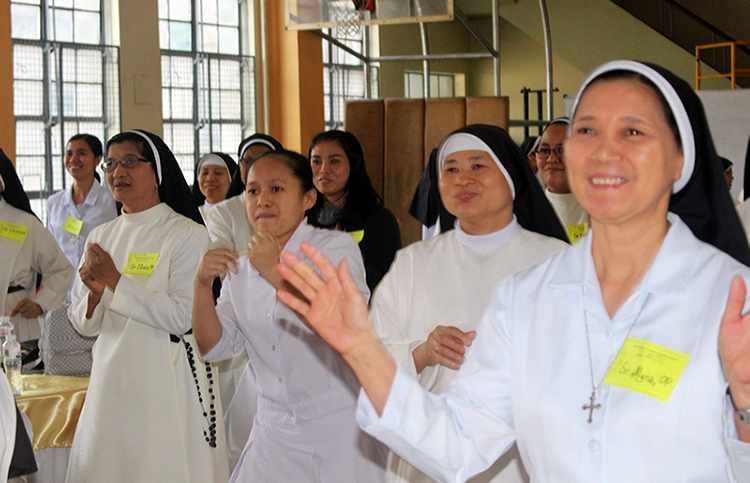 Religious are so active that they become less attractive, Father de La Rosa said, encouraging the Sisters to lead an orderly life and to align their lives with the will of God, as guided by the Beatitudes. Blessed are the poor. Happy people are those who are not afraid to lose anything because they claim nothing as his/her own. Learn to limit your wants because your needs are only little. Blessed are those who mourn. People mourn because they have lost or miss someone who is precious or something that is valuable. When we lose our sense of mourning we become apathetic, Father de La Rosa said. We don’t see the value of someone with whom we live or work. Blessed are the meek, those who don’t pretend to be strong. Meekness is a product of gratitude, of recognizing who I am before God. Blessed are the merciful. In the Dominican Rite of Profession, the question asked is, “What do you seek?” and the response is, “God’s mercy and yours.” Mercy is an expression of love. Blessed are the pure of heart. Single-heartedness makes an integrated, whole, and holy person. Blessed are the peace-makers. Peace is the tranquility of order. We are called to live an orderly life – that is, doing God’s will. Blessed are the persecuted. If good people are bystanders and don’t act to combat evil in society, evil triumphs. From left, Our Lady of Remedies Sisters Rose Bernardo, OP, Lourdes Pamintuan, OP, and Romina Bautista, OP, participate in a small group discussion with Dominican missionaries. Father Aytona attributed the vocation crisis to the lack of pastoral programs for the young in schools. He challenged schools to give youth not only academic formation but most of all value formation, which can be manifested in their desire to follow Christ and participate in the mission of the Church. The representatives of DOMNET Youth expressed the needs of youth today: proper guidance and wisdom from elderly, not from the Internet. Generally the youth of today are connected with the whole world through the Internet, but they still feel left out and in the end they are not happy. They need to experience the care and guidance of true mentors, not virtual mentors. A highlight of the Day of Recollection was the celebration of the Holy Eucharist, presided over by Father Quirico Pedregosa, OP, Rector of University of Santo Thomas Central Seminary. Feature photo (top): Sister Rosita Yaya, OP, Chapter Prioress of Our Lady of Remedies Mission Chapter, participates in the closing Liturgy of the Day of Reflection for Dominican Sisters International-Philippines. Sister Myra Dalisay, OP, participates in an ice breaker with Dominican Sisters from other congregations. 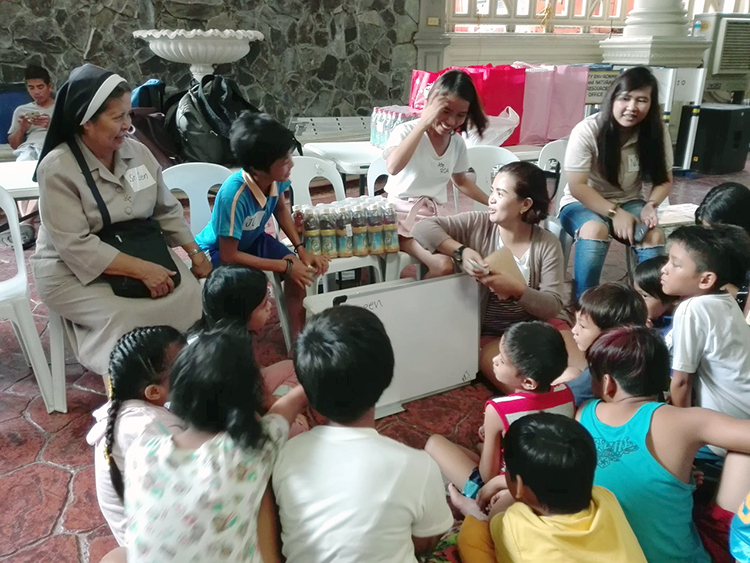 January 3, 2019, San Fernando, Pampanga, Philippines – The street children of San Fernando are gaining the literacy and numeracy skills that they need for a better life, thanks to the Adrian Dominican Sisters' (ADS) School on Wheels program. The program, established in 2017, meets the specific needs of street children who, with other children, had benefited from the Sisters’ religious education and feeding program. The ADS School on Wheels was established to develop a culture of acceptance and equality among children from disadvantaged environments, strengthen their social functioning potentials through basic education, and change the negative impressions of society toward street children. Basic literacy and numeracy are a priority of the program. The School on Wheels transport van was named Esperanza, or HOPE (Help Overcome Poverty through Education) in honor of the late Sister Esperanza Bonifacio, OP, who initiated the first feeding and catechetical program for street children around the San Fernando marketplace. Sister Zenaida Nacpil, OP, ministers to street children. Sister Zenaida S. Nacpil, OP, Director, and Sister Jolyn L. (Jules) Dungo, OP, a registered social worker, meet the children in the marketplace. “They have time for reading, writing, art appreciation and some basic catechetical instructions” as well as a hot lunch, Sister Jules said. On Saturdays, the Sisters and volunteers travel to the disadvantaged community to teach literacy and numeracy to the street children and other interested school children. Feature photo: Sister Jolyn “Jules” Dungo, OP, stops to talk to street children in San Fernando.